San Francisco is on its way to becoming the first city in the nation to ban all flavored tobacco products from store shelves. With all precincts now having reported their results, Measure E is passing with a whopping 68 percent of the vote. The final results won't be tallied until all vote-by-mail ballots are counted. The R.J. Reynolds Tobacco Company spent nearly $13 million on a campaign to stop the ban. The company sells the nation’s best-selling menthol cigarette. All that money was appalling to Patrick Reynolds, his grandfather founded the company, but he's now an anti-tobacco advocate because he lost his father to emphysema. “The only memory I have of him is a man lying down dying gasping of breath,” Reynolds said. Reynolds stridently opposes adding flavors to e-cigarettes like berry, nacho cheese or gummy bear. "It is an obscene, outrageous brazen ploy by the tobacco industry and by the vaping industry to ensnare another generation to be addicted,” Reynolds said. “And it's just got to stop." The citywide ban will go into effect 10 days after the election is certified. San Francisco could became the first city in the nation to ban flavored tobacco products from all store shelves. This includes everything from candy flavored e-cigarettes to conventional menthol smokes. City supervisors last year unanimously approved a ban on the products, but the tobacco industry funded a referendum, Proposition E, to put the issue before voters. Residents will decide in the June 5 election whether the ordinance goes into effect. Voting by mail has already begun. The R.J. Reynolds Tobacco Company is blanketing the city in radio, television and direct mail advertisements urging a "no" vote on Proposition E. The tobacco giant has shelled out nearly $10 million to save Newport menthols, which is the nation's best-selling mint-flavored cigarette. The ads, featuring vintage film of people smashing kegs during Prohibition, claim that it didn't work for alcohol and drugs, so it won't work for flavored tobacco. Billionaire Michael Bloomberg contributed $1.8 million to the Yes campaign. San Francisco resident Donna Anderson protested on behalf of the No campaign during a recent rally at Civic Center. She uses the example of marijuana laws to illustrate how a black market usually hurts people of color the most. “Black people, Latino people; people have been locked up -- and are still locked up -- having to do with little more than an ounce of marijuana," said Anderson. 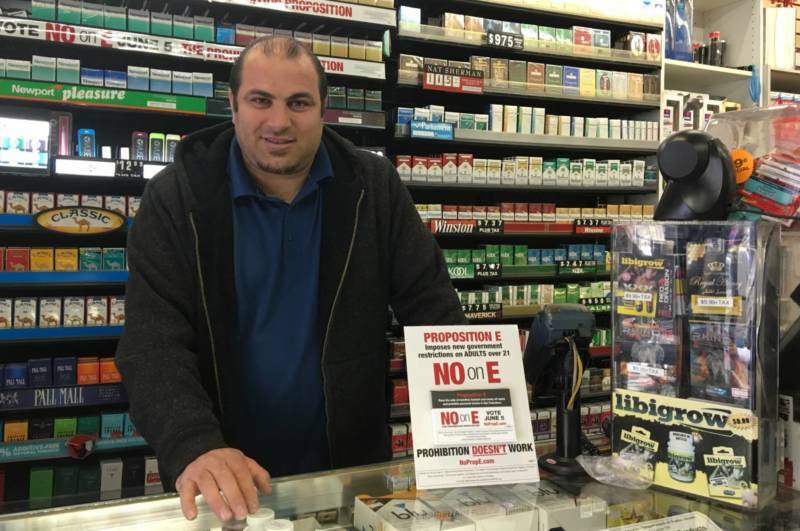 At the Mission Smoke Shop, owner Sam Azar has plastered his walls with “No-on-E” signs. “It’s going to hurt me as a small business here in the city by, like 30 percent or more," he predicts. He would no longer profit from flavored pipe tobacco, flavored hookah, infused cigars, or numerous racks of syrupy vape liquids. There are more than 7,000 sweet and savory e-cigarette flavors on the market -- everything from gummi bear and Unicorn Milk to Red Bull and nacho cheese. But medical experts worry about the role aromas play in enticing young people to try nicotine and get hooked on cigarettes. Derek Smith, director of the Tobacco Free Project at the San Francisco Department of Public Health, says flavors and menthol deceptively mask the taste of tobacco and make it easier to inhale nicotine. "Someone who has tried a cigarette for the first time will often turn green and cough," said Smith, in an email. "Imagine instead a cereal, milk-flavored inhalation that is considerably less harsh to start with." Smith says nearly all youth in the state start their tobacco habit with a flavored product, which worries doctors who gathered at a recent "Yes-on-E" rally on the steps of the Civic Center. Wright was standing next to a table laden with row after row of juice boxes and candy wrappers. They look like sugary snack foods, but they’re actually packages of vaping products. The New York Times recently reported on a federal crackdown of these look-alikes. Nicotine is particularly addictive for the teenage brain, according to Pam Ling, a physician and smoking researcher at UCSF. “This population is the future of the tobacco industry," says Ling. "The industry recognized decades ago that if they don’t get kids to start, they [the industry] will die out." The California Department of Public Health says the number of kids in California who vape is currently double the number who smoke, but some research suggests that a lot of those kids will be smoking cigarettes before long. 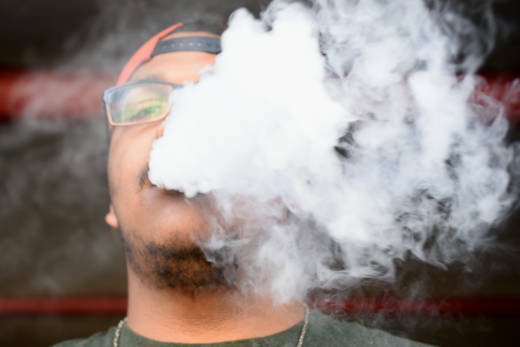 “Once these kids start with the e-cigarettes, the likelihood that they’ll be smoking cigarettes a year or so later is increased by a factor of three or four," says Stanton Glantz, who heads the Center for Tobacco Control Research and Education at UCSF. Glantz says that in his research, about a third of the kids who start using nicotine via e-cigarettes are not the kind of kids whose race, gender, home life and school performance would make them a high risk to pick up smoking on their own. In other words, vaping is increasing the pool of teen smokers. A 2016 report from the U.S. Surgeon General cited a 900 percent increase in the use of e-cigarettes by high school students from 2011 to 2015. Right now there is very little regulation of e-products at the federal level. Glantz also contends that a flavor ban will help adults who think they're inhaling a significantly safer alternative. “When e-cigarettes first became available, there was a lot of hope that they would be better than cigarettes," he says, "but the more we learn the worse they look." Though the long-term health effects of smoking e-cigarettes is still unknown, Glantz believes the safety of the devices has been oversold. "Electronic smoking products emit particles of chemicals, not clean air, and technically an aerosol, not a vapor," Smith says. "Think smog or hairspray — not the pure water vapor that steams when your teapot whistles." These ultrafine particles and toxins can damage the lungs and may lead to heart attacks. Levels of the particles in the vapor produced by some devices may be lower than in tobacco smoke, but aren't zero. If San Francisco voters pass the flavor ban, it will be among the toughest restrictions on e-cigarettes in the country; opponents of the measure fear it will set a precedent. Jon Brooks contributed to this post. This post has been edited since it was originally published.